- Today the German General Staff instructs VIII Corps to form a special Assault Detachment, or Sturmabteilung, of soldiers drawn from engineer battalions. The detachment is also assigned twenty experimental cannons from Krupp, designed to be sufficiently lightweight as to allow infantry to bring them along as they crossed No Man's Land. For the next several months, the detachment is develop tactics on the use of these 'assault cannons' at the Wahn artillery range near Cologne. - The commander of the Austro-Hungarian 4th Army expresses his extreme reluctance to attack, as requested by Conrad, based on insufficient forces, difficult terrain, and low morale. Conrad's reply today is to simply wave away the concerns; the relief of Przemysl is paramount, and thus all problems in the way of this objective are dismissed because they need to be if it to be achieved. Conrad threatens to take 8th Division away from 4th Army if it does not attack, and, faced with a diminuation of his commander, 4th Army commander relents and begins preparations. Further east, Russian attacks break through the lines of 42nd Honved Division, belonging to XIII Corps of General Pflanzer-Baltin's force. His left wing now faced with envelopment, he has no choice but to pull XIII Corps back to the Bystrzyca Solotwinska River. 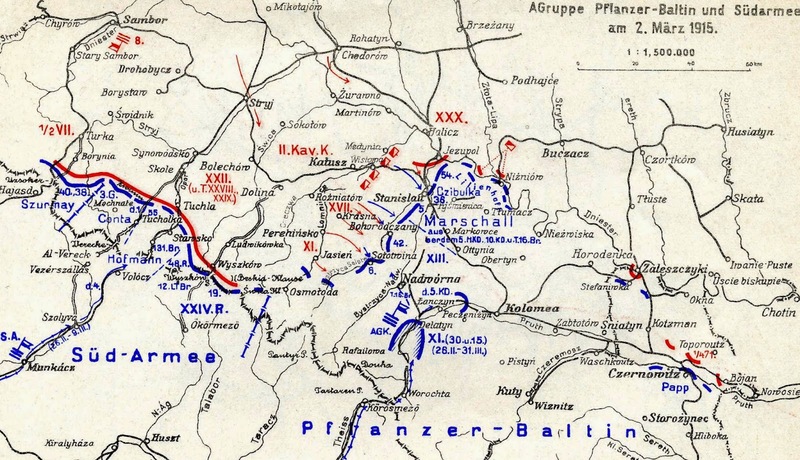 Though the retreat, undertaken after nightfall, is successful, it ends any hope of Pflanzer-Baltin's forces cutting behind the Russian forces holding Südarmee and forcing a general Russian retreat. General Brusilov's rapid concentration of reinforcements in the eastern Carpathians has thus turned back the one successful Austro-Hungarian advance of the winter months. left flank in the face of Russian pressure. - Today a redesign of the standard hand grenade used in the Austro-Hungarian army is ordered, as inexperienced soldiers who attempt to use the current model have a tendency to blow themselves up. - Writing to the Admiralty today, Admiral Carden reports that he expects to break through the Dardanelles and reach the Sea of Marmara in two weeks, provided that the weather cooperates. Tonight, however, a second effort by the converted trawlers to sweep the mines in the straits fails when they once again flee in the face of heavy fire from shore batteries.